I’ve gone silent here recently, but it wasn’t my intention. A couple weeks ago I got a call from the hospital regarding my dad and his struggle with pneumonia. What started out as a cold turned for the worse for him, and after a week-and-a-half confined to a hospital bed, comfort measures was the last resort. The doctors and nurses did all they could to get his oxygen levels up, but after trying to fight with him to keep the mask on numerous times, I knew it was time…Dad suffered enough…and he also knew it, too. I understood 100% what he meant by that. He never wanted to go into the nursing home in the first place; he just wanted to stay home, but he couldn’t. Since last summer he’d go into the hospital every single month for an infection, and each time there was something else wrong with him. His body was failing him. So from about 2:30 p.m. Wednesday afternoon to 2:30 a.m. Thursday morning, Dad gone without his oxygen mask, and during that time he would fall asleep, breathing irregularly, wake up a couple times, but after the second time, he fell back to sleep, but never woke up again. He was dreaming; he was seen with his hands in the air, acting like he was pointing out at something, pounding something like he was using a hammer, mouthed out words I couldn’t understand…I think he was working on his new home in heaven. The nurses waited until I got to the hospital before removing the mask so he could see me and we both exchanged “I love you.” Mike took the night off from work to join me until my brother came, around 10:00. I stayed until 11:00 before the snowstorm got worse. Robb said he was okay with me going home, so I made my cautious trek home in the pouring snow. It was about 2:00 in the morning when Robb said Dad was still breathing and making some noises, so he dozed off until about 2:30. Then he saw a nurse messing with some of the gadgets near the bed, then dozed off for about 10 minutes more until he was awaken by the nurses. I got the call from Robb after 3:00, and told him to go back to Dad’s house, get some rest, and we’ll meet up in the morning to go to the funeral home. I’m very surprised at myself with how well I’m taking all this, but I won’t be surprised when a month or two rolls around and it may hit me, just like it did with Mom 6 years ago. I was too busy making sure things were taken care of, trying to catch up with things at home, keeping the tot busy, although she has been very out of sorts through this whole ordeal. We laid Dad to rest the day before Valentine’s Day…and a very heart-broken holiday it was. Mike and I did get a chance to go out to dinner last Saturday, but I was numb by everything. Now it’s time to heal, but also time to wrap up some unfinished business and put a year and 4 months of very emotional stress and sadness behind me. Right now we’re preparing ourselves for the big move, but it’s not where you think. For the longest time I’ve been telling everyone that we plan to move into Dad’s house and give it some TLC. But after some long thought, Dad’s house just isn’t right for us. It’s a great house in a great location, but we really need a place where ALL of our stuff can fit comfortably, and for what I had planned for it, we might as well build a house. So it’s back to our old plan of buying a house, and it didn’t take me long to find one for sale just a few blocks away. This house I speak of is beyond perfect! I just hope and pray that if we button things up with Dad’s house fast enough, that this lovely 4-bedroom home with gigantic rooms and a “million dollar view” of downtown is still listed for sale. I don’t want to pass this one up…I just don’t…I’m in love with this house!! After the funeral and after Robb and his family left to go home, we went back to our little shoebox and just took it easy. What did I do? I took a nap and stretched out on the couch and watched old wrestling pay-per-views with Mike on WWE Network and played with Alex. It was just a time for us to breathe a little, the first time in a very long time. The next day I went back to work, surprising a lot of people, thinking I wasn’t returning until the following day, but I wanted normalcy. After a day of work and a visit with Dad’s insurance agent, I made cookies. 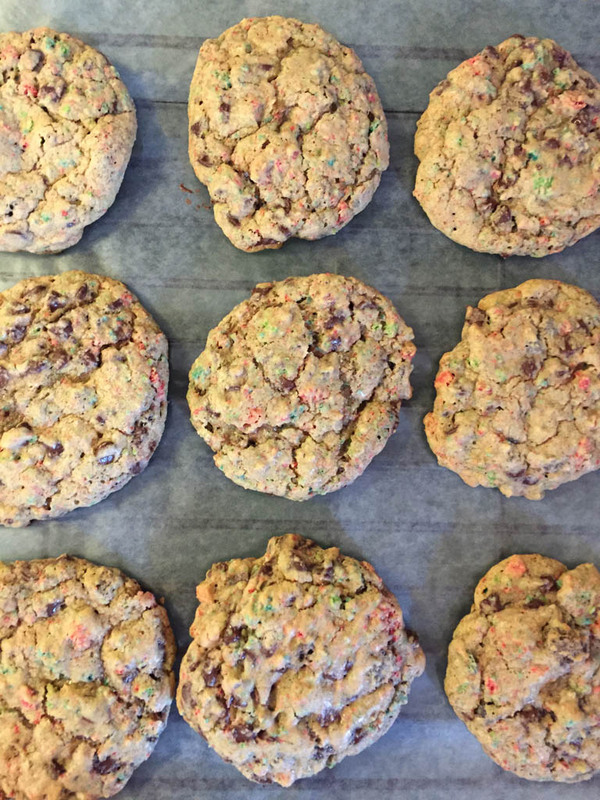 They were sugar cookies which I’ll share with you later, but I wanted to share the ones I made with cereal first, because I have a soft spot for cereal, and I think Dad did too. He always ate cereal in the mornings before he left for work. You would always find about 5 boxes in the kitchen cupboard, one for each work day, I guess. Plus there were five people living under one roof! We all loved cereal! 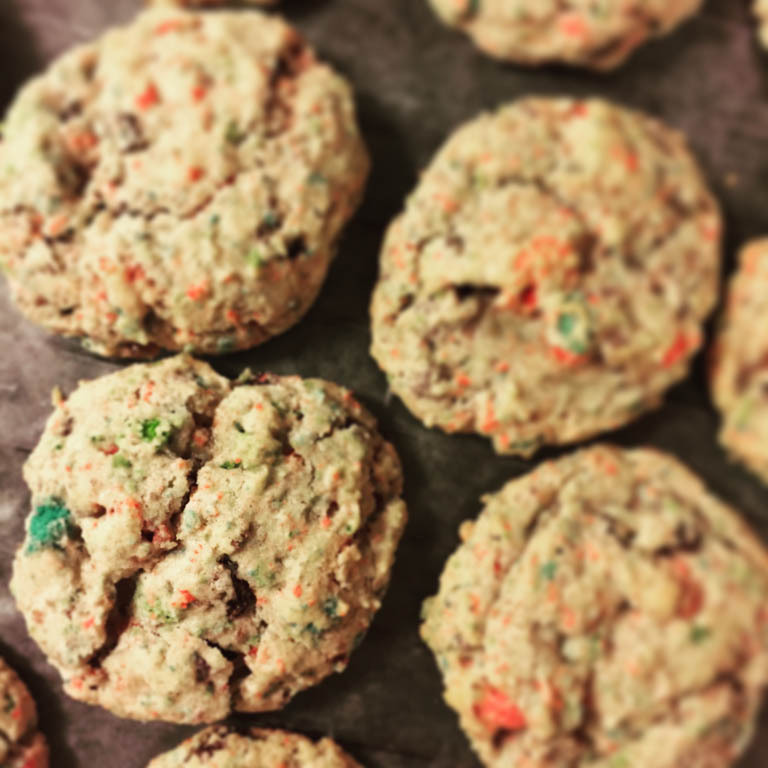 I used Cap’n Crunch’s All Berries cereal for these cookies, but you can use others too, like Fruit Loops or Fruity Pebbles. Don’t crush your cereal completely. 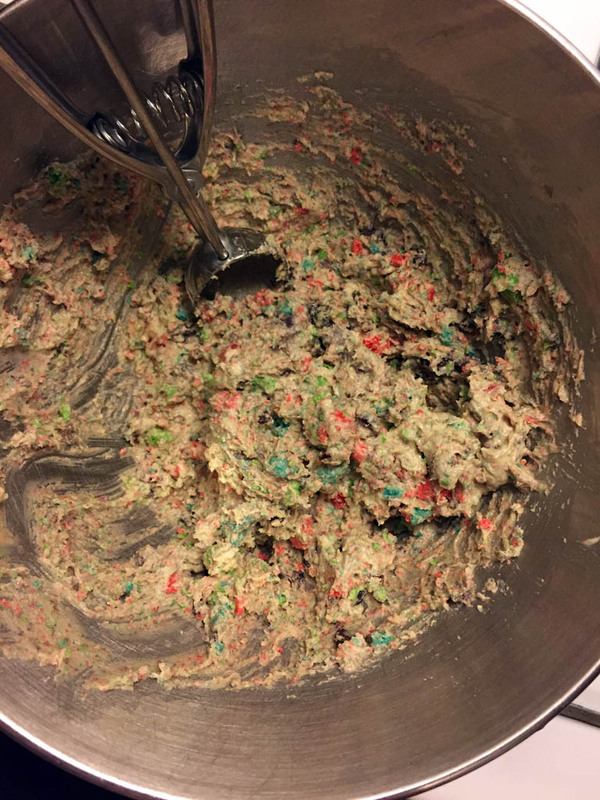 Leave most of the pieces in large chunks so you can have a little crunch in your cookies. These went fast, and I took some to work as well. So now moving on to bigger and better things. Getting my life back on track, I enter into this new chapter where we’ll be in a new house hopefully soon and Alex will begin school in the fall. I’ll miss my dad, but he’s watching. I hope he understands our reasons for not moving into his house, but I’m sure he wants us to be happy, wherever we end up at. – Preheat oven to 350-degrees. Prep your baking sheets with silcone mats or with non-stick cooking spray. – In a large bowl, mix together the flour, baking soda and baking powder; set aside. – In a mixer bowl, mix your margarine and sugars until soft and fluffy. Then add vanilla and egg; mix well. – Gradually add your dry ingredients with wet ingredients. 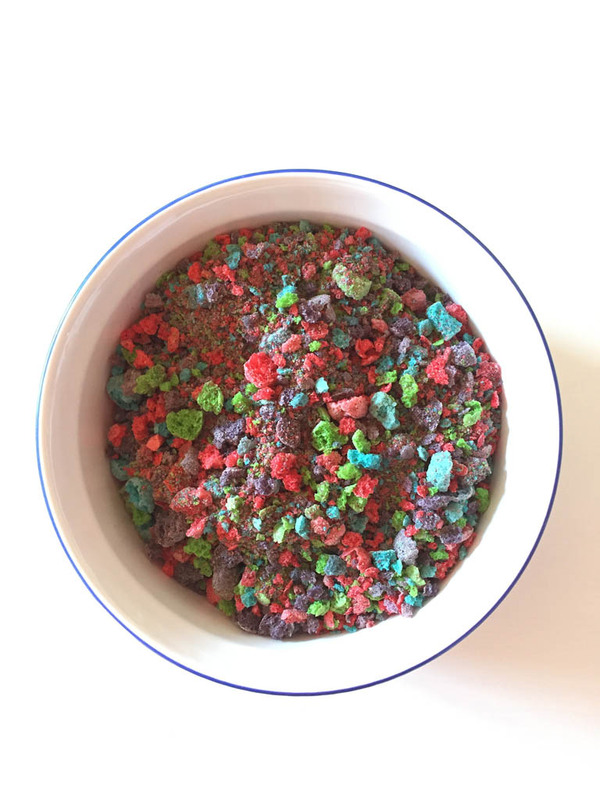 Fold in crushed cereal and raisins. – Allow to cool completely on baking racks. *I mostly use my medium-sized scoop for all my cookies, but if the occasion calls for it, I go for large or small scoops.